The last of Cyrus the Great's dynastic inheritors and the legendary enemy of Alexander the Great, Darius III ruled over a Persian Empire that stretched from the Mediterranean to the Indus River. 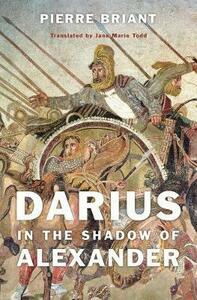 Yet, despite being the most powerful king of his time, Darius remains an obscure figure. As Pierre Briant explains in the first book ever devoted to the historical memory of Darius III, the little that is known of him comes primarily from Greek and Roman sources, which often present him in an unflattering light, as a decadent Oriental who lacked the masculine virtues of his Western adversaries. Influenced by the Alexander Romance as they are, even the medieval Persian sources are not free of harsh prejudices against the king Dara, whom they deemed deficient in the traditional kingly virtues. Ancient Classical accounts construct a man who is in every respect Alexander's opposite-feeble-minded, militarily inept, addicted to pleasure, and vain. When Darius's wife and children are captured by Alexander's forces at the Battle of Issos, Darius is ready to ransom his entire kingdom to save them-a devoted husband and father, perhaps, but a weak king. While Darius seems doomed to be a footnote in the chronicle of Alexander's conquests, in one respect it is Darius who has the last laugh. For after Darius's defeat in 331 BCE, Alexander is described by historians as becoming ever more like his vanquished opponent: a Darius-like sybarite prone to unmanly excess.